The picturesque village of Balcombe in Sussex just 50 kilometres south of London are today gearing up for being the first location for fracking operations in the UK, even though no fracking will take place at first instance. A poll conducted by Balcombe Parish Council last year showed an overwhelmingly opposition to fracking with 82% being against. But the council have stated that it has no power whether or not fracking will take place, but that they’re taking the view represented by the majority of the Village inhabitants. Cuadrilla though are saying they’re not planning to carry out fracking at this stage only test drilling. Last week the Chancellor George Osborne announced the world’s most generous tax breaks for fracking in a measure to kick start the industry in the UK. A strong protest presence are thought to be gathering at the drill site in Balcombe from 7am under the name ‘The Great Gas Gala’, we will be bringing you up to date with the latest developments. 6:35 GMT: The morning’s first tweets are coming in from activists on their way to site. It’s on! Work halted. Trucks stopped by Balcombe Blockade/ http://t.co/AkUGt3kOlX For news and pics please use #balcombe and GET DOWN HERE! 13:15 GMT: A fair amount of people out in Balcombe today with demographics suggesting a mix of local people and activists who have traveled from London and Brighton. 13:25 GMT: Today’s activity with have gathered quite a lot of coverage with coverage on both The Guardian, The Independent and BBC as well as reporters present from Channel 4 and RTCC and apparently also coverage in Poland, Puerto Rico, France and Ireland. 14:30 GMT: Frack Off are claiming victory for today at least, but much more of the same are set to continue tomorrow. Free Bus from Brighton to Balcombe 7am tomorrow (friday) from Old Stein bus stop (near RBS). 50 spaces, lets keep the frackers out. Pls RT. 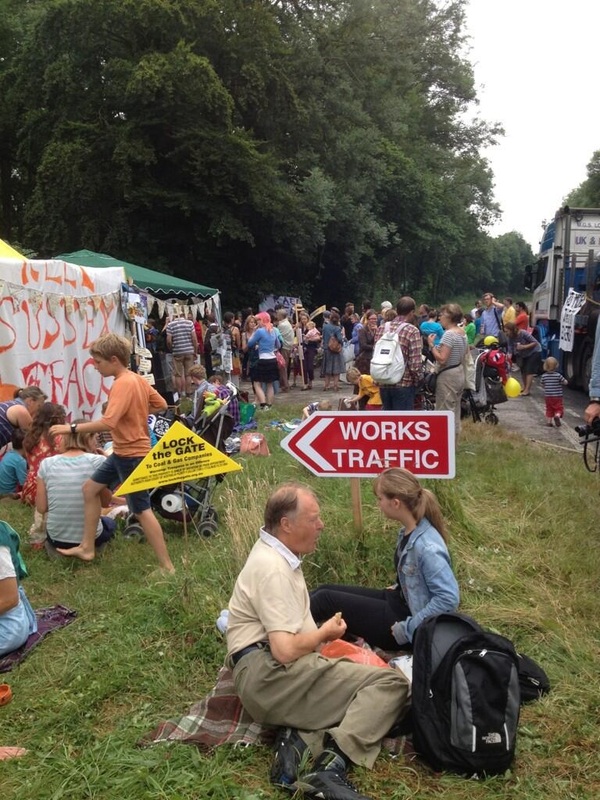 14:45 GMT: Atmosphere at Balcombe scene – source Frack Off. 15:45 GMT: We’re closing down the live blog for today, but will be back if any other developments were to occur and of course tomorrow. 18:40 GMT: While we wait for the protests to start again tomorrow, this video gives a scale what could be in store for the UK if fracking takes off. 18:45 GMT: Gas expert and pro-fracking Nick Grealy says that he inserting some balance into this debate at Channel 4 news at 19:00. 20:50 GMT: In Channel 4’s report from Balcombe this evening, one protester said that they had more trick up their sleeves such a occupying the drilling rig. The big question is how far is this protest movement prepared to go to stop drilling? There will be a point possible tomorrow or Saturday when Police orders the protesters to move and let’s the truck inside. Only time will tell us when that would happen and who would be prepared to take part in risking arrest. 23:20 GMT: Frack Free Sussex are saying on it’s Facebook page that 40 people will remain on site tonight and are urging people to get there early tomorrow as it’s likely Cuadrilla trucks will arrive around 7am again. 10:25 GMT: Work have been halted for a second day for 24 hours. 10:35 GMT: The media interest doesn’t seem to be slowing down here is The Telegraph’s Louise Gray announcing her arrival. 10:50 GMT: Frack Off London appealing to Londoners to come down. 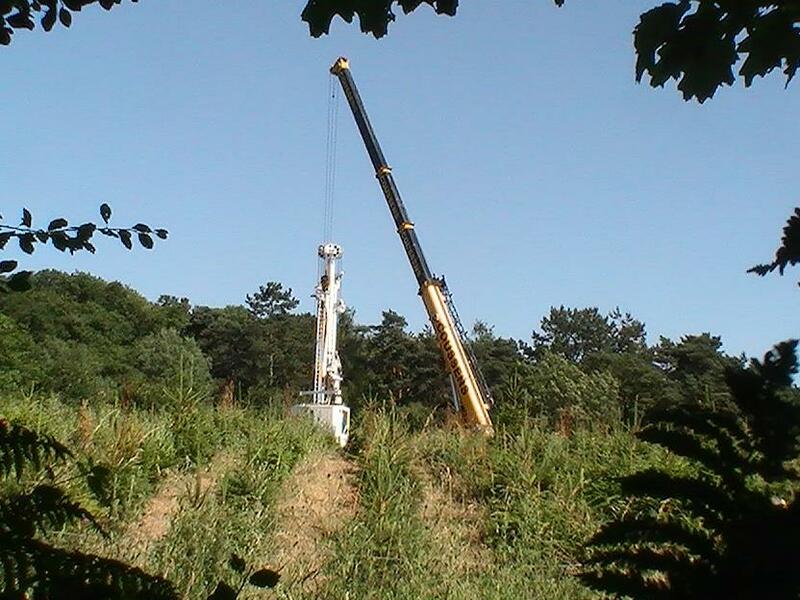 11:25 GMT: A lot of talk have been made of what precisely Cuadrilla are doing in Balcombe? Cuadrilla is a shale gas company, but have said they will only be drilling for oil and that no fracking will take place. Despite of this the protest is a fracking movement. At this point it would be illegal for them to frack. They have neither asked for, nor received, permission to do so. Nor are they primarily interested in gas.But it wasn’t always that way.The firm actually arrived in Balcombe in April 2010 – or at least their request for planning permission did.The company wanted to drill in an old well, last used by US oil giant Conoco Phillips in 1986 to look (unsuccessfully) for oil.The well has since been since plugged, abandoned and used as a storage site for the nearby woodland.Cuadrilla applied to upgrade the platform and drill an exploratory borehole to look for hydrocarbons – oil or gas – at the site.But technology and economics have changed and the Cuadrilla application went beyond what Conoco had done.In short the planning permission included provisions for what we all now know of as fracking – though it did depend how much oil or gas comes out through conventional methods.Indeed when the issue resurfaced last year Balcombe Parish issued a statement on fracking saying the original planning permission “would permit the use of this technique”.Balcombe sits within the Weald Basin. According to a document prepared by the British Geological Survey (BGS) for the Department of Energy and Climate Change that area has seen multiple oil and gas wells drilled in the past and could be home to both shale gas and – potentially – shale oil formations.The old Conoco well leads many to suppose its oil they will find – indeed that is what Cuadrilla themselves believe – but as recently as May the firm were still hedging their bets,“If Cuadrilla finds oil or gas” a statement read “a series of extensive technical, environmental and public consultations would take place before any further decisions are made.”They are looking for oil – but the nature of exploration is that you can’t be totally sure what you will find especially in a region recently opened up for shale prospecting. In short they will drill a well through various layers of rock, taking samples and testing for the flow and permeability of any oil or gas reserves they find.They have applied for and secured a permit from the Environment Agency (EA) to handle waste – including, for example, gas released during the drilling which the company plans to flare.The firm intends to carry out what is called an ‘acid wash’ at the base of the well. This involves using dilute acid to ‘clean’ the rocks, allowing any gas or – hopefully for the explorers – oil to flow up the well bore.If they find nothing or just a small conventional oil well that Conoco somehow missed – the shale gas party will move to another town.But if they find oil or gas trapped in shales under the Sussex hills, resources which can only be extracted by hydraulic fracturing then this is likely to be only the prelude to a far longer story. The target prospect is oil located in micrite, a type of limestone within the Kimmeridge shale formation.DECC and the Health and Safety Executive have scrutinised Cuadrilla’s plans and the company has received the environmental permits required for this type of conventional drilling from the Environment Agency.The company does not have consent to use hydraulic fracturing. If Cuadrilla decides in the future it wishes to frack or to conduct further tests in Balcombe, the company would need to apply for further permissions, including consent from DECC. 13:00 GMT: Things seem to be escalating in #Balcombe as apparently ten arrests have been made. Police are moving in and removing protesters and it seems some are putting up a fight. 13:05 GMT: What so far have seemed friendly, peaceful and a family atmosphere seems to be turning ugly. Jus off phone with @Frack_Off who claim police at #Balcombe #frack site “dragging” peaceful protestors away from sitting in front of gate. Just seen what’s going on at the #Balcombe #fracking protest. Arresting peaceful protestors for protecting their water? NOT IN MY NAME. If you can get your bum down to #Balcombe to help fight against #Fracking DO IT! 10 arrests already…disgusting heavy-handed police. 14:00 GMT: It appears for now that protests are continuing behind police lines. As Day 2 of the Great Gas Gala winds down it’s looking like Balcombe 1 – Cuadrilla 1 with all to play for! People will be staying the night at Cuadrilla’s site and begin a weekend of anti-fracking mischief from tomorrow morning. We will be closing down this live blog for now. The situation in Balcombe remain unchanged, protest are continuing behind police lines, trucks are going in and out of drill site but escorted and protected by the police. Camp as we understand it are growing. 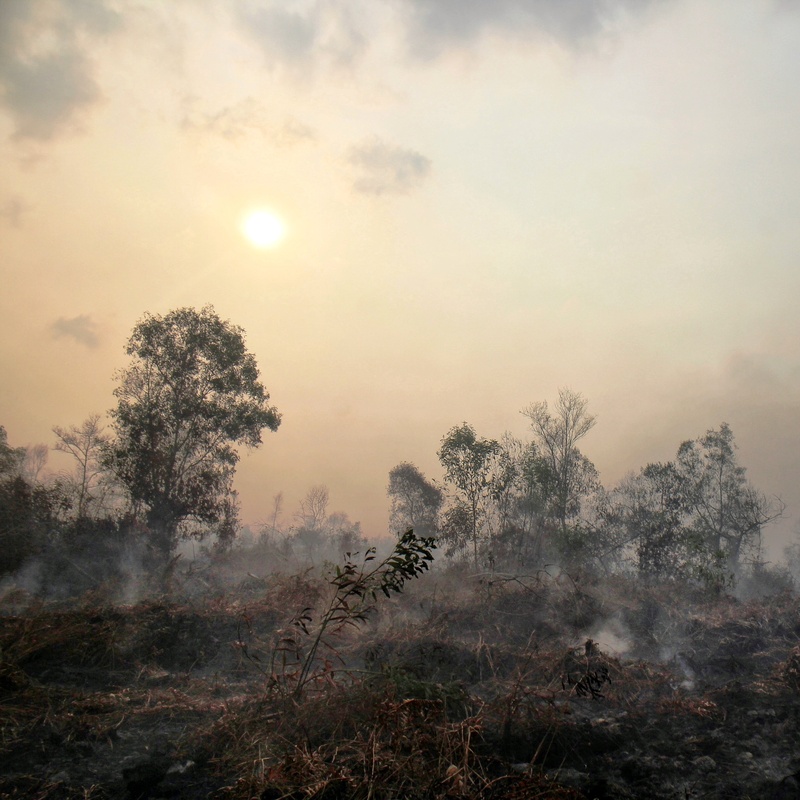 We will continue to monitor the situation closely and bring our you up to date should anything change.